I'm writing today from the NELA-ITS Spring 2008 workshop. The handouts are available below, so I'll just be annotating with a few points throughout the day, and also trying to add pictures to flickr. 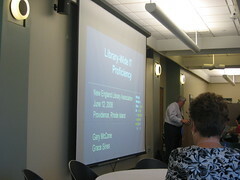 Overview of the National Agriculture Library, and the services they offer. Being a national library, they are a resource for everyone, so check them out. Why are IT proficiencies important? It's important to get IT support right the first time with the end-user, so front-line staff need to feel comfortable in both doing the support and managing expectations (we cannot "fix the internet"). Technology Core Competencies Abilities, knowledge and skill required to do the job - can be itemized based on areas or tasks, such as "printer & copier," "operating system," "email," etc.